I had just enough time to enjoy a gorgeous morning sky on the Refuge before heading off to the black bears along the tracks of the Toonerville Trolley. Definitely worth getting up early for. No sun rise this morning. It was several hours before I saw it. I watch the northeast C Pool trumpeter swans chase off two intruders. I found eight Pied billed grebes at the end of C Pool. Great to be seeing so many…finally. I found a 2nd year eagle on G Pool but it flew before I could shoot it. It went over to the feeding tree on E Pool. I also had two loons fly over me while on G Pool. Then I found a pair of sandhills with a colt sauntering down the drive at the end of the Fishing Loop. I was able to get some shots of them as they flew over to the end of D Pool….where they were assaulted by three adult sandhills. The adults tried protecting the colt…but they all ended up flying out of D Pool across to C marsh. That was exciting to watch. I guess they aren’t ready to be social yet…as they do when they are staging for Fall migration. I found two loons on D Pool that took off as soon as I got on them. One of them had the red over yellow leg band. I enjoyed watching a young kingfisher on B Pool trying to fish. I took another quick run through...too many people. I was so excited to find an American bittern in a swell hole at the start of the drive. We haven’t been seeing them as often as we use to. Then I had a car push me as I spotted a second one just in the next marsh. Luckily the traffic didn’t follow me on the Fishing Loop. I found ABJ and his two almost grown chicks feeding along the shore near their nesting site. I was so happy to get to spend time with our oldest know banded common loon at 30 years old with his 30th and 31st chicks. Found a great egret on H Pool…then a pair of sandhill cranes close to the shore. Of course, they didn’t stay long but I got to enjoy them for a little while. The territorial male trumpeter swan took out an intruding swan…protecting his mate and their four cygnets…as they proudly watched their daddy. I then headed out to the Show Pools. I found semi palmated plovers on the North pool. They even came up close to me. Then on the South pool I found two young great blues playing tag and a pair of noisy sandhill cranes. Jeannie and I went back in the evening. It was very quiet. Wood ducks and twelve pied billed grebes were the highlight along with a great blue heron in a marsh toward the end of the drive. The clouds were over the sun as it rose...following it as it rose. But it peeked out enough for some fun shots over J Pool and the loon chick. The adult went out to check out a visitor. G Pool...one of the eagles was in the dead tree. It allowed me to slowly get closer to it as the sun broke through the clouds. I spent almost twenty minutes with it...while a Caspian tern and fledgling were flying around. The wood ducks were everywhere. I did manage a couple of shots before they glided off. The trumpeter swans were sleeping/preening along the shore. I also found an osprey on a dead tree in Gray's Creek Pool. 2nd run through I found four young common mergansers at the F/E spillway. Sadly it looks like H Pool trumpeter swans have lost one of their five cygnets. A lone loon was flying over D.
3rd run through I found a great blue heron in J channel and got to get some nice shots of it and its reflection. Then I found a lone loon on G Pool…left leg double green bands. She slowly drifted closer as I sat in the brush talking quietly to her. A loon flew over...then another...but she remained. The longer I was there the calmer the water became...the closer she drifted toward me. This was prior to the solar eclipse which we had about 68% visible. It was a perfect way to spend a morning. The closer she got and the calmer the waters....the clearer her reflection became. Further down G Pool a gathering of trumpeter swans sleeping among the stumps...reflecting in the water. I went out to the South Show Pool....where I was greeted by a pair of sandhill cranes. They cackled and flew across the pool. Then I found a female wood duck...the Caspian tern and chick...a cormorant and trumpeter swans. I spent almost an hour there enjoying the wildlife and their reflections. A foggy morning with a few low clouds over the rising sun. AJB and chicks were out and about. J Pool loon was entertaining a party of five as the chick spent time with me...as the sun rose and refected. What a lovely way to greet the day. 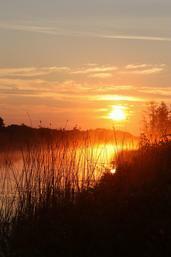 As the sun rose the fog thickened...loons were flying...bolting and belly swimming as they called. Nothing more mystical then the call of a loon in the fog. A pair of sandhills were cackling behind...then out of the fog the intruder flew over. The cobwebs were everywhere...heavy with dew like diamonds. I found the family of seven ring-neck chicks with their dedicated mom on G Pool. As I was watching a lone loon...a second one flew in and landed...right in front of me!! Then a seond one joined them as the sun was rising. The didn't socialize long...and took off flying in front of me so I could see their bands. 1-Right Green 2- Left orange/red R silver 3- Left double green. I found seven pied billed grebes toward the end of C Pool. 2nd run through a great blue heron was at the start of the drive...along with a pair of sandhill cranes. West E Pool loon with Left double green. C Pool trumpeter swans. Spent time with the Caspian tern and its young still on South Show Pool. 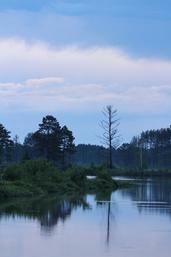 Seney evening. ...we found one of ABJ's chicks by itself still sporting a few traces of downy feathers on the back of its head. J Pool chick and adult were near the fishing pier. A great blue heron was in J channel...as the clouds moved in. Just before we left the Refuge the sun broke through the clouds...temporarily. The clouds were over the red sun...but it finally made an appearance. ABJ family was behind their old nesting site. I spent time with J Pool chick while the adult went out and checked out an intruder. The chick stayed close to where I was down in the brush. I would talk to it soothingly. I then found a cormorant in J channel...and got some cool shots of it back lit by the sunrise. I then found a sandhill crane in the drive as I approached G Pool. It stood there talking to its mate in the marsh. I slowly approached it waiting for it to finally fly...over to its mate. The sun had broken through the fog...perfect lighting. An osprey flew over...while both eagles were in the feeding tree. The wood ducks were all over on C Pool...sandhills flying...trumpeter swans...a perfect morning with the wildlife wakening all around me. I had three loons fly into E Pool...socialized for a while then all three flew off. L double gree...right silver...left orange/red right silver. An osprey flew over while I was watching them...then it flew back over later with a fish. I also found three loons on C Pool. And a beautiful doe in the cove. I spent an hour with a Caspian tern and its fledged chick on the South Show Pool. At first I thought it was ill...but then it bounced up and started begging its parent for a treat. Back on J Pool one of the adult loons was feeding the young one. The cormorant was still in the channel...and posed for me. Unfortunately someone drove right up on me...so off I went. Too many people being rude. I went to the North Show Pool...found yellow-legs and a great blue heron...but people pushed in and spooked them off. I left. It was a cloudy afternoon at 3:30 when Jeannie and I walked back to I Pool to finally see the loon chick there. The parent and chick worked their way toward us then along the shore. STill has its downy feathers. While were watching the loons two young ospreys had an altercation in the sky. One went back to its old nest behind the Vistors' Center. We found two of the young merlins in their tree. J Pool swans and five cygnets...and the young loon chick were out near the shore. We saw a bolt of lightening and heard thunder to the north...but luckily nothing developed. We then spent time with G Pool male..left red right silver. He was hooting and hooting...amazing to watch and listen. We finally found one of the adult eagles in the dead tree along G Pool...as its young called from the nest area. We also saw an osprey dive and catch a fish to the north. It was a very enjoyable evening though no great photo ops. We did find a lone loon at the end of C Pool but it didn't stay long enough to see its bands. 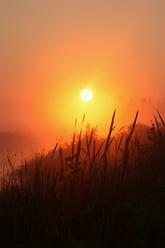 It was a gorgeous morning with a red sun rising through low clouds and fog. F Pool trumpeter swan family greeted me along with ABJ’s family which was on the move. G Pool eagle were on C Pool in a dead tree together. The C Pool trumpeter swan was greeting the day. V4 was out with her two ‘ugly duckling’ chicks the second trip through….no sign of ABJ. The one had just enough down on its head to look like a lion’s mane. It appears to be the older one…staying its distance from momma and sibling. I got spend a little time with East E Pool loon chick sporting its adult plumage. Finally one of the parents came and they moved away from me. I found a party of seven loons…and spent quite a nice time observing them. They eventually all flew off so I was able to get shots of their bands. While I was photographing the loons the trumpeter swan came up to get their pictures taken, too. Later in the evening we found a young northern harrier. The loons were all out too far. But we did have an young osprey in a pine tree on G Pool hunting. 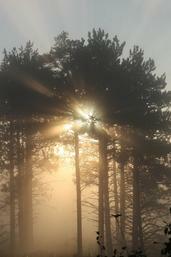 Another foggy morning but light enough for the sun's ray to penetrate through. A great blue heron flew out of a tree at the start of the drive and flew into F Pool. I enjoyed some interesting photo ops with fog and sun...and the cobwebs were gorgeous. I found a lone loon on G Pool just drifting on the foggy waters…Green band on her right leg. I did finally hear the eaglet screaming. It should have fledged by now...not a good sign. 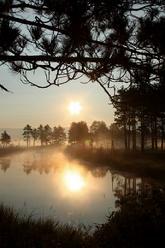 On the second run through the sun started to break through the fog just as I found two great blue herons on F Pool. Two of the juvenile merlins were in their tree. Two loons flew over along with a Northern harrier and Caspian terns as I was watching the great egret on H Pool. J Pool a great yellowleg and Caspian terns with a fledged young. Also a noisy kingfisher was flitting around. On D pool I found the trumpeter swans with their one cygnet gliding across the still waters. Then two loons appeared...then I found a third loon up in the corner near the drive. So I went to my favorite hiding spot and sat to watch the action. The intruder seemed to want to engage the other two in a 'game'...it was belly swimming...then started to take off but went back to belly swimming. This went on for quite some time. When I finally walked to the back side of the pool I couldn't find the pair of loons...just the intruders. Intersting. Yellow over red on the left leg...green/silver on the right. Then I found six loons socializing on C Pool. I hunkered down in the brush to watch and see if I could get any bands. All of a sudden I heard a diesel vehicle shut off their engine. A woman talking...then a horn was honking. I though someone wanted them to move out of the road. But it happened again....then a third time. This time I got up heading back to my truck. An older couple with a pickup and camper were there. They didn't think they could get around my truck which was off the drive. I said you could have just yelled out for me. Please do not honk your horn on the Refuge. I got in my truck fuming. Luckily a beautiful doe stepped out in the drive before I left the Refuge. She calmly watched me...as I watched her. Then another doe showed up. Well, that's just what I needed to calm my soul. Thank you. Michael and I decided to take a quick run before we headed home. I didn't get to spend anytime with ABJ and family and barely time with J Pool loons. I still didn't get anytime with them. I did get to spend a little time with C Pool trumepter swans and their four beautiful healthy cygnets as they fed along the drive. Then they went up on land in the shade to preen. Daddy warned me not to get to close...which I didn't. Perfect way to end two quick days on the Refuge. Heavy fog filled the air making it very difficult to see anything. I decided to finally just sit and listen to the wildlife awakening around me. Finally...around 8:00am the sun peeked out long enough to enjoy about twenty minutes with a great egret. The trumpeter swan territorial male chased off an intruding swan...flying low near me in the rising fog. It then flew back to its family where they welcomed him like a hero. Then magically the great egret flew toward me as the sun burst out of the fog. Perfect. It landed on a spit of land right near me...did a little posing then moved out farther to continue to fish. I was so blest to enjoy that time with nature at its best. The heavy fog moved back in as I headed down the drive. J Pool trumepter swans greeted me in the drive. I had to stop...as they continued to walk toward me. Finally they moved off into the tall grasses where their five cygnets were feeding. I also had to wait for a pair of sandhill cranes as they cackled and walked down the drive in front of me. I headed out of the Refuge around 9:00am. When I got down the road less than a mile the sun was shining brightly. Back to the Refuge at 5:30pm I found one little merlin across from F and a snapping turtle near the E/F spillway. Met up with Jeannie while watching J Pool loon chick and parent. The adult went up on an island to defecate...then back in the water. Great blue heron flew by as we were watching a wood duck. It circled back and landed in a pine tree along J channel. We spotted young hooded merganser on C Pool along with the trumpeter family with four cygnets. We were held up by a wrecker pulling a SUV out of an embackment at the end of the drive. There had been a medical emergency. We only had to wait a few minutes and left the Refuge around 7:30pm. There were a few clouds over the sun as it rose…but that makes for some dramatic effects. ABJ was out and about with the family. Another blood red sun peeked out from between the clouds. I found a Great blue heron on H Pool. There was an intruding loon on J Pool along with the trumpeter swans and their five cygnets. Two loons flew over J heading toward E Pool. Another Great Blue heron was at the end of J channel where we left it last night. I found a dozen common terns flying and screaming over G Pool. The nesting pair was not happy about the intrusion…and chased them off. The green banded loon was still there. The trumpeter swan families on C Pool were both out with their four cygnets close to the shore but in the shadows. F Pool loon family was together past the spillway. I got to spend some quality time with them. A loon flew over and apparently landed out farther in the pool. So both parents took off swimming out to meet the intruder. They left the two chicks in my care…yea…sure. But they were just right in front of me...so I guarded them carefully. They got spooked and ended up right next to each other…all sibling rivalry forgotten. Eventually ABJ flew back to the chicks…and V4 ended up on H Pool feeding. Unfortunately the clouds moved in just when ABJ came back. I watched the trumpeter swan male on H Pool go up the hill to attack some Canada geese…chasing them all off. He proudly came back down to his family…as the geese flew off across the pool. A small flock of green-winged teals flew into J Pool along with the intruding loon. As I was watching them a great egret flew to the east…then a great blue heron flew to the west….and the loon took off. I found a pied billed grebe on C Pool with an almost grown young calico. As I made another run through…I found a great blue heron in a tree across from H Pool. It flew before I could photograph it. But it looked like it landed just over the hill from my favorite spot. Yes…it was close to the shore…and there was a great egret there too!! I had fun watching them both. The great egret flew back farther as the great blue fishing along the shore. It then flew off farther back. But I sat in the bushes and waited…and watched…and waited. Finally the great blue heron flew back near the great egret. The egret flew…right in front of me. It landed in a tree…then it flew back by me again. While this was going on the male trumpeter swan was back on attacking the Canada geese. I ended my day with a sandhill in B marsh. What a great three days on the Refuge. 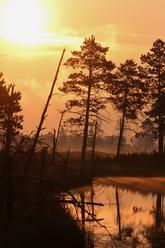 Clear skies as the sun rises blood red on the Refuge…with the foggy rising off the pools…perfect. ABJ and family were out and about already along with the trumpeter family. I love this quiet time of day on the Refuge. Everything waking up…cackling sandhills…hooting loons…trumpeter swans trumpeting…lovely. Two loons were flying as the sun was rising over F Pool. An eagle was in a tree across F Pool. Woodies are all around the Refuge…flying off as I interfered with their quiet morning. I found a lone loon on G Pool and the G Pool eagles were in the feeding tree. D Pool loons were back too far to check for a chick...again. C Pool had four loons visiting. 2nd run through I found a great blue heron at the start of F Pool. It’s always great to have them return to the Refuge…after their young have fledged and they bring some of their young with them. I took the Marshland Drive…lots of Canada geese and trumpeter swans. The east end loon chick has really grown. It’s over two months old now…and wearing its gray and white plumage. The west end chick was out by itself. Then one of the adults came from the island area…not with food…just to check on the little bugger. D Pool still out too far…and C Pool only one loon was visible. 3rd time around found one of the little merlins. H Pool the trumpeter swan family was swimming up to the little spit of land. Then I spotted a Great blue heron near the drive. I photographed it for a while then shot the trumpeter swans. Bam…it flew…of course. But I tracked it as it landed on a tree along the spillway drive. So back I went…I was able to sneak up on it and get some nice shots. As I was working my way in closer….I heard a car stop. The people got out…slamming the doors…spooking my heron. They even had big lens…but were shooting the trumpeter swan family that was out in the middle of the pool. They couldn’t see me…my truck?? Please people respect other people. If you’re trying to photograph wildlife…be quiet…inconspicuous. I did find two young blue-winged teals in the channel with a perfect reflection. The lone loon is still on G Pool. Later I found it was Greenie. I decided to take a hike and check on the D Pool loons. I found the juvenile merlin and the momma. I found the loons near the spillway. They were hooting…like they were looking for their young. No sign of the little one. Looks like it didn’t make to a week old. Sad. Another loon flew over…left leg yellow over red…right leg green over silver. The loons never called out like they will if they have young to protect. So I spent time with the merlins. The little one flew into a tree near me. I enjoyed the time with it. I then found a lone loon landing to visit the C Pool loons. 4th time around…I found ABJ family around the big curve. So I spent time in the brush watching V4 feeding the growing chicks. ABJ went off by himself. J Pool trumpeter swans swam over to their nesting island to preen and bathe. G Pool ring-necked duck with her seven growing young were out and about. I found wood ducks and pied billed grebes on C Pool. Then off for a midday break. Back at 5:00 with Jeannie…it had just stormed but the sun did come out for us as we watched the J Pool loon chick preen…working on losing its downy baby feathers. A great blue heron was at the end of J channel…wood duck in H channel. 2nd time around young flickers at the start of the drive…and great blue heron on F Pool behind ABJ’s nesting site…and the GBH still in J Channel. We had hoped to find ‘BC’ at the end of C Pool in the setting sun but no luck…and the clouds moved in over the sunset. We made a quick run through Saturday night and were thrilled to find a loon chick on the west end of E Pool. Hope the little bugger makes it. Then we were treated to a beautiful loon at the end of C Pool. It let me get close enough to get some lovely reflections in the setting sun. Sunday was a gorgeous morning on the Refuge. Low clouds were over the start of the sun rise but dispersed and the fog rose from the pools making for some awesome displays. H Pool had a lone loon that flew off as the sun rose. 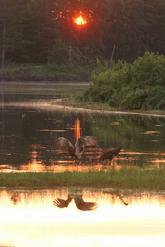 A pair of sandhill cranes was on J pool silhouetted by the rising sun. along with blue-winged teals and a greater yellowleg. The male wood ducks are all around the Refuge. They are in eclipse…non breeding plumage. There was a loon party of six on C Pool but too far out to get shots. Also starting to find pied billed grebes with one or two almost grown chicks. I headed back to the Refuge around 6:00pm. It was a perfect evening! The sun was gorgeous I found young merlins carrying on near F Pool….but the lighting wasn’t good. More shorebirds were out on J Pool in the evening light. Junior was out on J Pool, too. D pool loons were back too far. I did enjoy watching a wood duck in C marsh sitting and preening on the lily pads. On the 2nd time around I found all three of the merlins sitting on a dead tree limb. I photographed them till my neck got tired. I just sat in my truck and they just looked at me. Luckily not a car came through to disturb us. Back to J Pool the shorebirds were more plentiful in the evening glow. One of the adult loons was eating a crayfish. I found a great blue heron at the end of the J channel. I spooked a pair of sandhills on the drive between E and G Pool. Then I got to spend the evening enjoying quiet time with ‘BC’ the seven year old daughter of ABJ and V4. The sun was setting perfectly to reflect in her beautiful red eye. PRICELESS! 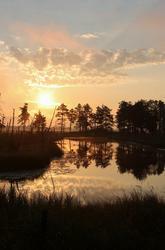 It was gorgeous morning on the Refuge. Temperatures were in the 40’s slight breeze but barely a cloud in the sky. I didn’t see F Pool loons but did find J Pool loons out too far to stop and photograph. I headed to the H marsh to capture the rising over the channels. I could hear G Pool eaglet calling to be fed. I found one lone loon at the far end of G Pool. It acted like it was expecting company…but none arrived. I could hear loons flying around calling. So I headed off to D Pool. I found three loons out together so I hunkered down to wait. They did fly slowly closer to me…but they were quite calm. There was no posing…pointing or diving…just quietly swimming and circling each other. Two loons flew over and I was hoping for them to land…but they kept flying east. The three worked their way near me. Then three more loons flew over. I was excited to see another ‘gathering’. But they, too, flew to the east. Well, it wasn’t long when all three of the loons flew…to the east. When they took off I was able to shoot two of their bands. One was BC…ABJ’s 7 year old daughter and Z4 his 11 year old daughter who is matriarch to D Pool. I thought that was interesting that the ‘sisters’ were hanging out together. It was even more interesting when I found on Tuesday after we got home that D Pool actually hatched a chick!! It was crazy to think that they were nesting and she was partying. That means they re-clutched for a third and successful nest. Hope the lone chick survives. Then I found out I Pool loons had one chick a week ago. The pair wasn’t even there in mid-May when I hiked back there. It was great to hear of at least two more loon chicks. That makes six so far this season. On my second run through I was delighted to find a Great egret fishing on H Pool. It flew to the west where a great blue heron was fishing. Yeah…it’s been since spring that I saw a great blue here. Then I found a handsome eagle on the dead tree at the end of J Pool. It was nice to finally see an eagle out near the drives. The G Pool eagle was hunting from the feeding tree at the end of E Pool. The Canada geese were everywhere in the drive…taking their sweet time to move. I did find a visiting loon at the end of northeast C Pool…red over yellow bands…along with “BC” loon…who flew off. On another run through I was thrilled to find F Pool family near the shore in a quiet protected area. I was able to spend a little quiet time with the family. V4 was busy catching crayfish…ABJ was collecting minnows for the little ones. Both parents were working diligently to feed the two growing four week old chicks. V4 seems to have really stepped up to the plate this year to help with the young ones. That is very good considering the one chick seems to like to wander. I was excited to find young green-winged and blue-winged teals in the J channel along with two great blue herons. On G Pool I found a female hooded merganser with four growing chicks…and a common tern protecting a nesting area on an island. I found a beautiful 3 ½ year old eagle along the C/B spillway…but it was camera shy and kept flying off before I could get a decent photo. On the last run through of the morning I found the great egret and great blue heron still on H Pool. Then I hiked back to spend a little time with J Pool loon and five week old chick. It’s always a treat to spend quiet time with them and the trumpeter swan family with five cygnets. I arrived to clear skies as the sun was ready to rise. The temperature was 49 degrees but no wind so was perfect. ABJ and his family were already out feeding in the middle of the pool with the sun rising behind them. I was greeted by H Pool trumpeter swan family gliding across the pool in the pink glow of the reflecting rising sun. What an amazing way to greet the day. Then I spent time with J Pool out with their three week old chick in the brightness of the rising sun…colors that you can only enjoy at this early morning hour. G Pool had four loons out socializing but they didn’t appear to be coming in any closer. While I was watching them the eaglet started chattering from its perch still hanging out at its nesting tree. Then a great blue heron flew over. That’s the first one I have seen since early spring. I decided to move on…I heard loons flying and was hoping I’d find some on D Pool. The D Pool trumpeter swans with their one cygnet were in the channel. One G Pool eagle was in the feeding tree on the west end of E…the other was in the osprey nest on D Pool!!! How sad…the osprey must have lost their young. Now the eagles will start deconstructing the nest…as they do every year. The chick must have died this past the week. The parents were nowhere in sight. I almost miss them…but there were three loons way out in D Pool so I decided to stop and wait to see what happened. The two more flew in. They worked their way toward the observation deck. Then two more flew in. That caused them to move out farther. By the time it was over…I had twelve loons!! But they stayed out farther in the pool. They did some bolting but mostly just swimming…pointing…peering and diving. Finally some of them decided to take off. I was able to get lots of shots of them and their bands. I was back down to three loons…then two more came back in. I was hiding down in the brush along the shore. They slowly worked their way right toward me. I was so excited. I kept praying no cars would come by…we were right by the drive. Well, all of a sudden they started yodeling and calling. Two of them bolted out of the water…and in the vulture position…right in front of me!!! I have never experience anything so amazing!!! The one continued to hold the vulture position for the longest time…as if showing the others it was the superior one. It was a magical time for me to share with these amazing creatures. PURE JOY!! Then two of them took off…but the other three remained in front of me…till a car came through and stopped. They kept their noisy vehicle running…and talked loudly spooking off the loons. I kept watching them...as two more flew back in. Then two more took off. I remained till all of the loons had left the pool…two hours later!! WOW!! What an amazing morning on the Refuge. Everything else was pretty mundane after that. Except when I came back through and found ABJ…V4 and their two chicks feeding along F Pool at the first curve. I spent about forty-five minutes watching them as they headed back toward the start of the drive. The one chick is already staying aloof. ABJ had to call it before it followed them. That can be a concern. The last two years ABJ has lost one of his two chicks at about this same age. I enjoyed a quiet drive through the headed home. Sunrise was obliverated by clouds. But I made a quick run through found a red banded loon at the end of G Pool. It took off shortly after I photographed it. The eaglet was branching out on the backside of G Pool. I found a lot of ring-necked ducks with young ducklings. The sun finally came out around 8:00am. The trumpeter swans are everywhere on E Pool as usual. I was happy to find V4 and her two chicks on F Pool. She was being so diligent bringing them food...so unlike her. She's usually off preening while ABJ is tending the chicks. But with the lack of chicks hatch...the other loons have been flying around intruding or socializing. ABJ was actually off chasing off an intruder. He did eventually fly back to join the family. A Caspain tern was out on an island on H Pool. The red banded loon was back on G Pool...but too far out to photograph. The D Pool trumepter swans were in a channel in D marsh feeding in the beautiful morning sun. I found a momma hooded merganser with four good sized young in tow on C Pool. The milkweed is in bloom and the aroma is intociating. No wonder the monarchs love it. Two loons are flying around stirring up trouble with the loons with chicks. I found J Pool momma out with her three week old chick in the channel. I was able to spend some quality time with them for almost an hour in the beautiful morning light. The Caspian tern was fishing all around the pool while the two loons flew over several times causing momma loon to go into defensive mod. I also found some cedar waxwings and a white-tailed doe before I had to head out. We came back for an evening run. The skies were clear so the sun was going down gorgeous. We found a young belted kingfisher harrassing its parents for a free meal. It landed in a tree right next to the drive. We stopped...I got it in focus...and it turned and looked right at me. The light from the setting sun was shining in its eyes. It turned and faced the sun...posing for me for several minutes before heading off to find that treat. We watched as the sun set into a pillow of light clouds. Perfect ending to another lovely day on the Refuge. It was a very foggy morning. I had hoped for the sun to burn it off but it was almost 7:30am before that happened…but it was all worth it. The trumpeter swans were scattered all around E Pool. It was a beautiful sight with the sunrays breaking through the fog. Then as I was heading down along H Pool I spotted the trumpeter swan with family with their five cygnets. I turned to look behind me…and there was not one…but five loons!!! I quickly backed up…parked and headed down the trail. Amazingly they were right along the shoreline. I stealthy snuck up on them…as they started yodeling and bolting out of the water!!! OH MY GOSH!!! Then not just one but two them were bolting with the others belly swimming!! What an awesome sight and sound to witness!! H Pool has no territorial loons so it was interesting to see that chose this spot to meet. I spent almost an hour and a half with them. They floated all around the pool…posing…preening…peering and diving. Finally two of them took off…later followed by two more. At one point a sixth loon came in…and stayed with the one odd man out. It would start to take off then land on its belly. It did this several times. Finally the two started bolting and yodeling as they faced each other. Wow!!! That was an interesting exchange. They eventually moved over to the other side of the pool and I moved on. I am almost certain the one causing all the ruckus was ABJ…red over green band right leg. It was an interesting to think he would come over to H Pool to challenge the visiting loons. I then found J Pool near the shore…but the lighting wasn’t good. Then a was small three loon party on D Pool. I watched as the visitor took off. While I was watching them…I heard the young merlin screaming. So I headed off to see if I could find it…and I did!! I also found a beautiful doe feeding along the way. I love these petite raptors. It spent more time screaming to be feed…instead of trying to find something on its own. I also found a doe along the C/B spillway and both pair of trumpeter swans on C Pool with their four cygnets each. I pulled in to B Pool and found a lone loon. It was calling and so was the C Pool loon. While I was watching the loon I heard an American bittern. It flew by me and into the B marsh. A little later it flew back by me…taking food to its young. It was a great morning on the Refuge. I arrived on the Refuge just as the sun was rising. I found ABJ and family moving away from the islands and heading out to feed further out on the pool. The trumpeter swan family with their five cygnets was also out further. The osprey chicks were screaming to be fed. J Pool family was out by the stumps as the sun was rising over the pool. Then I found the trumpeter swan family next to the drive feeding. I spent a little quiet time watching them before moving on. 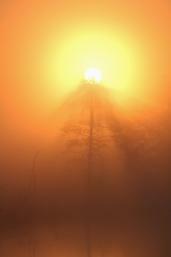 A light fog was rising from the channels as the sunlight penetrated it. I found one loon on the end of G Pool. The eaglets were starting to chatter to be fed, too. I finally spotted a pied billed grebe on D Pool near the E/D spillway…but that was it. D Pool loons and the C Pool loons were on their respective pools. On the second run through I found a momma wood duck with five large ducklings around the first curve on F Pool. It was nice to finally find some more young. I first spotted the J Pool loon chick in the channel then the parent came up to feed it. So I hiked down the channel to spend a little quiet time with them. On G Pool three loons were enjoying some quiet time…with an osprey fishing overhead. One of the eaglets was ‘branching’ out near the nest. So hopefully we will start seeing some action around G Pool. I got spend time with the lone loon at the end of C Pool again…the one with the right leg band red with white letter BC and left leg silver band. Then it was time to go get Michael to check on the research blind along the tracks of the Toonerville. Sadly the rain moved in come evening so we didn’t make a night run. I enjoyed a rainy stormy morning to start my day on the Refuge. But I waited patiently and finally was rewarded with about an hour of sunshine. It was quiet after the storm...trumpeter swans with their young...the loons chilling. I did find a lone loon at the end of C Pool. It eventually flew west. A male red-winged blackbird yelled at me as he ate spiders out of the trees. On my second run through I found a female merganser in the small pool along the Entrance Rd. and another at the start of F Pool. There are as usual lots of trumpeter swans on the east end of E Pool. I also found a male wood duck in eclipse along the far channel of J Pool. Otherwise a very quiet morning. Later in the afternoon...a beaver was out bringing in a large branch to feed his young in their lodge. ABJ and family were back at their old nesting area...heading toward the spillway. Pretty much status quo...except I found a momma hooded merganser in the J channel with one growing chick. Sad...last year she had at least five make it to adulthood. I finally spotted a sandhill crane in B marsh. It has been a sad year for the sandhills. We have hardly seen any adults let a lone colts. I was on the Refuge at the crack of dawn. I found ABJ and his family near the point where they were the night before. I settled down in the muck and watched them awaken to greet the day. He had the chicks both under his wings while she was out fishing. I was able to spend some quiet time with him. He stayed right in front of me!! I was so thrilled to have this time before another photographer arrived. Momma loon came back with a fish...preening on the way. She feed it to one of the chicks then left...as he stayed in front of me. Later I found an eagle being chased off of D Pool by the osprey pair that has a nest there. Three loons were observing the action. I found a doe on B marsh. Later I found ABJ and his young family near the drive just before the Fishing Loop. Then I found three young kingfishers chasing each other around G Pool...while a loon flew over. Another doe in B marsh...and a young merlin. It was a very rainy morning so we decided to head over to Munising one last time before the summer chaos begins. The day cleared and the sun came out. We found ABj out too far with his family. J Pool was even farther out. D Pool loons were at the back side of the pool. On the second run through we did find an American bittern that allowed me to snap one good shot in the setting sun. The buck was back in H marsh...Z4, the D Pool male loon was near the shore preening for me in the beautiful setting sun. The 3rd run through I did get to spend a little time with ABJ and family as the sun set. I was on the Refuge by 6:30am to overcast skies. E Pool had three small cygnets...not the usually pair of trumpeter swans with the eight cygnets. I found the ABJ family and enjoyed the solitude of wathcing him care for the young as she fished and preened. At first I thought they may have lost one of the chicks. I was seeing on on ABJ's back...then down by his head. It was actually both of them just in different locations under his wings. Whew...that made me very happy. Momma, V4, would bring fish that were too big for the little ones to eat...at this time. He would take the fish and hold it...the eventually eat it. The little ones appeared very healthy and eating well. He kept them with hime the whole time. He would take a break...preen and feed keeping an eye on them the whole time. She went into a yodel when another loon flew over...then took off after it...returned after making sure the perimeter was safe. I spent over an hour with them. But decided to move on to return later when hopefully the sun would peek out. J Pool looons wer out too far...again with their one chick. G Pool eagle in the feeding tree on E Pool. I didn't see any loons on G or D at this time. The C Pool loon was preening. A loon was on B Pool near the islands. The trumpeter swans on C Pool with their five and four cygnets respectfully. Nice to see so many of the cygnets have survived so far this year. When I came back through the sun was out and I got to spend some time with ABJ and his family. She brought in two big fish...which he again held on too then ate. Then he did some fishing for them. He yodeled and dived when something flew over...causing the babies to go off his back....eventually letting them back on his back. Four trumpeter swans flew over but that didn't seem to cause any duress. F Pool trumpeter swans now have seven cygnets...which is still good. J Pool loons were a little closer but still too far for decent photos. I found a nice buck in H marsh. Looks like the same one I saw near G Pool last week. Good to see them. I found Dumber fishing G channel. When all of a sudden he dived...right in front of me!! I was zoomed out too far...and set for sun. He of course dived close and in the shadows. But I did manage to get a couple of decent shots. How cool! I found two more bucks in B Marsh! But nothing else too exciting...as I headed back to get Michael to head for the research blind along the tracks of the Toonerville Trolley. We made an evening run through the Refuge which wasn't very productive. We of course had a gloomy rainy evening on the Refuge...But found a little green heron just around the first big curve on F Pool!! It’s the first one we have ever seen one n the Refuge...And only second one we have seen in the U.P. so we figured it had to be good luck! The loons on C Pool had visitors which doesn’t bode well for young...No little ones visible yet...But with this weather who knows. Well...it has been raining all day. I did go to the Refuge around 8:00am. What do you do on a rainy day on the Refuge? Sit with your sweetie in a tree watching the 50+ trumpeter swans...that's what the E Pool eagles were doing. The rains are keeping the flora gorgeous and lush...wild irises...shrub roses...cinnamon ferns etc. C Pool loons were off their nest eating. All the trumpeters still have their cygnets...amazingly. F Pool was on their nest. J Pool single loon by the drive…so they hopefully are still on the nest. The G Pool single loon was at the north end. We spent a little time with the trumpeter swans and their cygnets...all seem to be doing well. F Pool loons are still on the nest. There was no sign of any others till C. They were entertaining the visitor again. I don’t think that's good sign. A momma common merganser went tumbling down the rocks at C/B spillway with her seven chicks...in the pouring rain. There were two loons on B Pool. I thought maybe a pair...then one bolted out of a grassy area they were investigating…who knows. Raining so hard I headed back to the trailer around 10:00am. We didn't go to the bears...not with a chance of a storm that way. Well we no sooner headed out to the Refuge then the rain came back in around 4:00pm. But we enjoyed time with the trumpeter swan families. F Pool had their young on an island taking a break…and J Pool was out feeding their young cygnets. We did witness C Pool loons entertaining a couple of guest loons. That’s not a good sign for a successful nest…especially not with this cold rain. The weather was not in my favor again. Since the Refuge drive is closed to do some road maintenance this morning I decided against hiking this morning. So off to the bears we went. It’s perfect weather for them. We got to see Little Red and eagles...turkey vultures and our sandhills with colt. So it was a good day….even without the sun. Back on the Refuge around 4:00pm Yeah!!!! J pool loons have a chick!!!! The sun started to break out. The loons are definitely not going back to the nest…so only one chick. They were out behind the tern island where we think they nested. It really doesn't matter what the weather is...truly...when you can spend it in such peaceful surroundings. We were blest by the presence of this common loon....one of the 'singles' that are 'visiting' or one of a pair that had a failed nest. Whichever it is...it was lovely to spend time with it last evening. We did end up with some sun. The J Pool loons though stayed way out but at least they have their little one. F was still on their nest. G Pool...one was out in the middle another hooted from where we think their nest is...so maybe soon. D Pool were out together...but it was so nice...I'm not worried...yet. Unfortunately I think C Pool have failed. They were clear up in the middle of C Pool where the one swan had been nesting. Every time we went through yesterday and today they were off the nest. Finally on Monday evening on the Refuge...the sun actually came out!! And I found something to photograph in that sunshine. This osprey was very accommodating....sitting in a tree along the drive at G Pool. He didn't seem to mind me as I shot him from the truck. He was intently hunting. Earlier in the day we found him...and the two ospreys from D Pool having a discussion about territory. We actually this is Dumber...the mate to Dumb...who have been trying to have a successful nest for the last 4-5 years. Last year...they almost succeeded but a wind storm took down the nest shortly before the eggs were expected to hatch. We think they have nested on the back side of H Pool...hopefully. Guess what it's doing??? Yep raining….on and off all morning. I got a quick glimpse of brightness...then it was gone. Sadly J Pool loons are keeping their little one out by islands. First run through G POOL party of four. I spent time watching them. Two of them flew off then came back in. One of them was Greenie…the male that was the mate two years ago. It was him and the female that took a quick trip together…then came back to the party. C pool same thing plus three at the end of C!! It’s definitely not looking good for loon chicks. ABJ is our next hope. It's supposed to clear by 3....If we're lucky. The Wilson snipes are flying along with Northern harrier which I haven’t see in a while…so hopefully they have young to feed. I got on and off peeks of sun and rain….and seeing more and more wood ducks throughout the Refuge. I also found a momma ring-necked duck with ten little ones in C Pool. J pool loons were out by the nesting island. At first they were calling and acting like they had lost their young…when out from the brush popped the chick. Whew! F loons were still on the nest. I spent time on B pool. The one loon seemed to have a chick on its back. I watched for almost an hour...no luck. The other one came up without food…acting like it was trying to get the other one to engage. On Sunday one of them bolted out of the Tufts of grass...maybe something got the chick and this one still thinks it's alive...who knows. But it never dove but I never saw anything either. When I came back through B pool loons were preening together…no chick. The one had a red band...maybe the West E/H pair? The wind and rain returned so headed back to the trailer to prepare to head home. Finally the storms and rain cleared around 8:00am so off to the Refuge I went. By the time I got there...the clouds had moved back in. I took my first run through the Marshland Drive since it reopened after shoreline restoration. I found the E Pool loons with their one chick...out farther...and the chick was hiding under momma's wing...and of course it was gloomy. They were surrounded by the 'singles' club of trumpeter swans...probably thirty-forty of them. Further down near the swan observation deck I found the 'young couples' group. They were all paired off. Then several of the singles decided to fly down and stir things up. So cute to watch the couples flutter and talk to each other. I found six snapping turtles laying eggs all at one time in one area. I then took the Fishing Loop...where I spent some quality time with the E Pool trumpeter swans and their eight cygnets. They were so adorable...all well behaved...staying close to their parents...who were digging up food for them. They would pop through momma's long neck as she was head first in the water bringing up food for the young. Too ding dang adorable!! On down the drive...F still have 8...J still have 6...H still have 8...G has 0...E.West has 0...and D down to 1. While I was at D Pool the trumpeters brought their one young up to where I was sitting. All of a sudden the D Pool loon lets out a yodel...a warning. I looked up and there was bald eagle flying over...with a cygnet in its talons. I know it happens...they have to feed their young...but I don't want to see it. The Circle of Life. It was the G Pool eagle taking it back to its two growing eaglets. Quiet yet...still loons nesting along with other creatures. Hope to see young ones soon. We got to the Refuge Saturday night at 7:30pm excited to spend a beautiful evening out with the wildlife...only to discover the drives were closed due to high winds. Crews wouldn't be in till morning to clean-up. So there went my early morning sunrise on the Refuge too. So I got up a little after sunrise and headed to the South Show Pool. I knew the trumpeter swans had six little cygnets. I was hoping they still had some of them. I was so pleased to find they still had all six!! Last year they lost all of them within the first day. It was beautiful lighting and they swans fed along the shore in front of me. What a treat. If the Refuge drive hadn't been closed I would never had spent time with them. Also I spent an hour with bobolinks along a country road...which was a double treat thanks to what I thought was a disappointing occurrence. The North Show Pool only had one trumpeter swan...a pair of young hooded mergansers flew in for a few moments....kingbirds...kingfishers...cedar waxwings etc were the main show but not too active. We went back to the Refuge after the afternoon storms. F Pool trumpeter swans have five and eight cygnets...E pool eight...H Pool eight...ABJ/mate were on their nest...thank goodness. Crazy cloud formations. Snapping turtles still everywhere laying eggs. J Pool trumpeters have six little cygnets. We did hear a Virginia rail and Wilson snipes. Headed out before the storms moved back in. I was on the Refuge by 6:30am. Very foggy and gloomy…But eventually the day brightened up. I enjoyed hearing the sandhill cranes cackling in the fog when I arrived. They greeted me along the drive then flew. Another pair were just around the corner on the Fishing Loop. ABJ was on his nest...with mate nearby. I spent an hour and half with the H Pool trumpeter swans. Precious moments. Daddy was already out with one of his cygnets. It was so cute to watch...daddy's little shadow. Finally two more joined the other one in the water...then a fourth. Before I left them...there were six in the water...and at least one or two more still on the nest with momma. As I was heading down the drive near the J channel I spotted FOUR American bitterns flying!!! It looks like there was territorial dispute for nesting areas. How cool was that!!! Then an osprey flew by with a huge northenr pike!!! Great morning on the Refuge...even in the fog. I found two loons at the far end of G Pool swimming quickly together. By the time I got down near the shoreline...then 'walked' on water and flew. I knew then that one of them had to be an intruder. Possibly 'Greenie' the male from two years ago. The red banded male eventually returned without the intruder. One of the G Pool eagles was in the feeding tree at the end of E Pool. D Pool trumpeter swans were out with their three cygnets....as the ospreys were tending their young. I spooked seven or eight wood ducks on C Pool. Then I spotted a pair of trumpeter swans coming off their nest with five little fluffy cygnets. As I was watching them I heard a loon. I finally spotted her in the dark waters near the shore. It must be T7's turn to incubate the eggs. She seemed very calm...so hopefully she has settled down after last year's successful chick...and will now become a good momma. Time will tell. I made another run through around 9:00am. I found the male blue-winged teal in his spot in the channel across from F Pool. We're sure he is guarding his mate who is on a nest nearby. Back to the H pool swans where I enjoyed watching all eight cygnets out in the water feeding with their proud parents. What a joy to watch nature at its best. What could be better....new life....sunshine and the Refuge. J Pool trumpeter swan female was on her nest island being bombarded by common terns. I was sure she had young ones, too. I couldn't believe that the terns would attack a momma with young. I think they may want to use the island to nest on now. So they were trying to hurry her off. 2:30pm. we were back on the Refuge to bright sun and mild temperatures...and our good friends the Rautiolas. We watched H Pool with their young...then found J Pool had a few young but still on the nesting island but in a different location. The loon was out on the back side of the pool patrolling. Michael spotted a sandhill crane on a nest at the end of E Pool. We had Wilson snipes calling and flying around us. The mate to the sandhill chased intruders off G Pool then eventually flew back to its mate. The eagle was on the feeding tree. We made a quick run through the Refuge last night before it rained. Found H Pool trumpeter swans hatching cygnets. Then Dumber was hanging out in a tree just down the way. So I got up to head to the Refuge around 8:45 am to gloomy...damp...misty morning. The trumpeter swans were still hatching cygnets...with at least three visible. G Pool I spotted one loon midway...then Wilson snipes were flying and calling around the west end of E Pool. D Pool trumpeter swans have three cygnets...and the west end of E Pool have none. The D Pool osprey was feeding chicks. I left at 10:30am to dark clouds...heading back to get Michael to go back to the research blind at Toonerville. Back around 6:30pm...we found the E Pool loons with their one chick but the lighting was not conducive to getting good shots. It was just good to see the little one doing so well. A spotted sandpiper flew in while I was watching them. The Canda geese were being hassled by the terriotorial trumpeter swan. ABJ and mate were on and near the nest...thank goodness. We met up with the Rautiolas...Jeannie and I spent some quality time with the H Pool swans. We actually got a little sunshine to enjoy them. We got to watch daddy take three out to feed them...then another one came down from the nest to feed, too. We could see at least two others...but were sure there was more. We ended our day with a gorgeous sunset over C Pool. I woke up at 5:20...To clouds...Woke up at 7 to sun...As I left the trailer dark clouds were moving in from the southwest. It was raining before I got to the Refuge. ABJ and V4 were together way away from nest. They weren't as far away last night when we came through. Saw a pair of loons on H...But could be J...I didn't see any on J. G was alone near shore but quickly moved away. D loons were together out behind the long island. C loon last night was alone out by islands just after the big curve. Today they were together near the trumpeter swan nest. I think the bugs are getting to them. The weather isn't too cold so hopefully everything will be fine. Even the swans were off their nests for awhile. Heading to the bears before rain moves in. Then looks like better weather this afternoon at the Refuge!! So I'm sitting in the rain...waiting for it to clear to make another run through. One of F Pool loons was working on the nest. I could see one egg for sure. Then fun on H pool. Two loons headed for little island to the left to trumpeter swan nest. They went up and on it and tried working on it. But the male flew over them landing on shore near me...The other went after them. Quite entertaining! Then two followed by a third osprey flew over. Then the loons preened! One had a left silver band and right blue band... The other had a left orange/red band and silver right band. So we'll have to investigate. I'll see if I can read any numbers on the computer. No sign of J or G....But G yodeled when the eagle flew over. Oh and I heard sandhills cackling on the back side of H…maybe a colt to defend?? I walked along the shore of E Pool to shoot an eagle in the feeding tree. Lots of swan and geese down further. Hope to get a hike in tomorrow. Osprey on D sat in tree for me but not great lighting. No sign of D loons or C loons. But I videotaped a bittern glunking in B marsh!!! Made my night. I'm watching a pair of sandhills feeding in EPool and the eagle in is it's tree. Hope to get a break in the weather and find ABJs on the nest. It looks like there may be a chance at a decent morning. I'm getting out early regardless. Oh and I missed a snipe next to the road across from G pool...I was watching the eagle fly over to E.
East end loons have one chick…on the cuurve before the spillway...Not far. The eagle is bothering them. They were staying fairly close to shore. It’s always so amazing when I can spent quiet time with a new family. They were quite fine with my presence. Of course I stayed down low and remained quiet. I keep hoping for sun!! It keeps trying…but it looks like the fog and gloom are going to hang out with me, too. Just spent time talking to the Patton's s...The Refuge loon counters. Chick was here at 5 last night. They said we have an average of 18 loons this season. J pool lone loon was by fishing pier. Looks like all lone loons on all the pools so we will probably have chicks all at one time!!! Hope! I caught a quick glimpse of a fox running down the Gray's Creek drive heading to E Pool. Well at 8:00 Michael said "the sun is shining". That's all it took. I was dressed and ready to go! Of course the sun didn't last long. But H pool loons are still trying to decide where to nest. We found one loon on G pool. We spotted D Pool loons out from the long island. We watched them as they came closer. The female went up on land…followed by the male. We were treated to seeing them copulate!! Both C loons were by old nest site. But still they could just be taking a break...hopefully. A merlin was screaming near the nesting site along F Pool. The weather is over cast and gloom. There was a lone blue-winged teal male quietly sitting in the channel across from F Pool…where I found ABJ and V4. They were out looking for a new nesting site…so sadly their first nest failed. I watched them build that nest and incubate the eggs for over two weeks….sad. I watched them for a half an hour. She would go up to an area…he would watch…then she would move on. Hopefully this next nest will be successful. There are a lot more Canada geese goslings throughout the Refuge. Caspian terns are being noisy. Common terns are courting…ring-necks aren’t nesting yet. The loons are still acting like the may be nesting on J and G Pool. I found spotted sandpipers on the west end of E Pool along the G Pool eagle in the feeding tree. No sign of D Pool loons so hopefully they are nesting. I found the C Pool loons together at the west end of C Pool. Time will tell when what gets hatched. Unfortunately the black flies and mosquitoes are out!! Rainy cold and windy with temps in the 50’s. It was a very quiet morning. ABJ and V 4 were not near their nesting site. Sadly it appears the rain and black flies have driven them off the nest. Hopefully they will reclutch. There is still plenty of time. The E Pool eagle flew over being hassled by a small bird. Spotted a blue-winged teal male on E Pool along with trumpeter swan and Canada geese with some young and a pair of sandhill cranes. F Pool loons’ nest was visible with two eggs…water encroaching but not over the nest. No sign of any loons on H pool…just the trumpeter swans nesting. J Pool loon was patrolling by himself. Common terns were courting on their stump. And a couple of spotted sandpipers were flitting about. I spooked a bittern…and Wilson snipes and Virginia rails were calling. I witnessed J Pool territorial trumpeter swan run off a single intruder…not once but three times. It finally landed close enough that I realized it was probably their sole surviving cygnet from last year. It’s a rough world out there. Mom and dad are now preparing for new little ones…but Junior doesn’t understand why he can’t come home again. Along the west end of the Fishing Loop. I heard a blue-winged teal calling. It was a female calling and courting a male. They sat side by side on a tuft of grass in the channel…bobbing their heads up and down. Another male came swimming by…then a third flew in. They were the backups if the first male failed to impress. The rain starting really coming down…and another car came up behind and spooked them off….so I moved on. Then off to visit the bears…3rd year eagle landed along the tracks. Pileated landed by the blind. Another mature eagle landed in a spruce tree near the blind!! A pair of sandhills walked from the south all the way to us. We watched little Red come out of the woods and follow a single sandhill up toward us in the fog. The sandhill flew over us because of the other pair of sandhills. Little red went into the woods…then came back out woofing trying to scare off the sandhills…to no avail. We did see a very large bear to the south…but it never came down to us. We were there from 1:30-5:30. Back at the Refuge we watched J pool working on another nest. F, D and C were all still together. G pool was alone so hopefully one is on a nest. It was a cloudy morning so I didn't get on the Refuge till 8:30am. It was cloudy windy but in the 50's. An American bittern flew in front of me as I started around F Pool. The pool were very quiet...once again just a few Blue-winged teals...ring-necked ducks...common and Caspian terns. F Pool loon near the nest....J Pool loons out together. The Canada geese pair lost all of their goslings at the end of J channel. It looks like the trumpeter swans figured it out and decided not to nest their again. I did find a pair of common mergansers there, too. I watched one of G Pool eagles take food up to the nest. I waited but it seemed to be really ripping up the food. a Caspian tern was intently fishing along G Pool, too. The G Pool loons were out meandering from island to island looking for the perfecting nesting site. They came up closer to me. I watched her choose a spot and start pulling up nesting material!! She then went on the back side of the island and went up on land....waiting for him. I guess he didn't like the location so off they went. It isn't the first time I've watched them building a nest only to abandon it. Bummer. I did have Wilson snipes flying over winnowing...as another answered from the marsh along G Pool. I love to hear nature especially during courting season. D Pool loon was being elusive. C Pool loons were near the old site again. We came back in the after with our friends, Ken and Jean, as a storm started to move in. We enjoyed watching a pair of loons on H Pool...which we thought were the J Pool loons. They like to hangout on both pools. Looks like maybe one of the E Pool loon pairs have moved over because of the lowering of E Pool for band restoration. Time will tell. We just have to see if we can see bands. The J Pool loons were enjoying island hopping again. We had hoped to witness something exciting but they weren't in the mood. G Pool and C Pool loons still searching too. Can't wait to get back Saturday night to see if any new loon nests or other visitors. Another cold and windy day in da U.P. but at least the sun is out!! I took a hike around F to E to H to J and back by I Pools. Last main hike before the Refuge opens for the season tomorrow. The Canada geese are out with their goslings...alls sizes. A few warblers singing in the conifers. E Pool is now very quiet. I found a pair of sandhills feeding near the F/E spillway...a few blue-winged teals...trumpeter swans but otherwise the migrants have moved on. There were still a few Caspian tern and a few common terns now, too. Trumpeter swans are flying around trying to disturb the nesting couples. A lone sandhill crane is trying to find a safe place to feed without nesting sandhills driving them off. ABJ and his mate were near the nesting area. I got to spend some time with J Pool loons. They were at the far end of the pool. But I sat and waited...they came and swam right by me. They were courting...peering and pointing. They eventually went over to a sandbar where the female got up on the land. She was patiently waiting for him to decide that is was safe to mate. Unfortunately the nesting trumpeter swan male decided he didn't want them that close to his nest. So he honked and swam right up by the sandbar...interrupting the mood. So off the sandbar she went as he swam away. The common terns were starting to gather in the area...courting and carrying on. I heard a sora in F Marsh...and Wilson snipe. I spooked an American bittern, too. A few more warblers around I Pool. Trumpeter swans...geese and noisy kingfishers. The nesting merlins were being quiet. After a cloudy morning I got the Refuge around 8:30am. It was 40's and NO wind!! The water was like glass!! I found several male wood ducks at the start of F Pool. The Wildlife Drive is closed to entry due to heavy equipment working on E Pool bank restoration. But the Nature trail was open...so I head back along I Pool to J Pool. I found yellow-rumped and palm warblers. Two young female hooded mergansers flew into I Pool. A lone white-tailed doe was feeding in F marsh. I could hear the merllins before I saw them. I was able to sneak up on a female bufflehead at the end of J Pool near the merlins nest. While I was photographing it...the female merlin flew in with a chipping sparrow in her talon!! I then headed down to J Pool to check on the loons. The trumpeter swan was on her nest on the island. I scanned...nothing...then way across the pool...I spotted them. Both of them were out and about. I decided to calmly...patiently just sit and wait. I knew they would 'eventually' make their way over to me. It didn't take them long...and they worked their way down...right in front of me. She stuck her head out in the defensive mode. She's definitely not as social as he is. He proceeded to pop up in front of me. I was able to get some beautiful reflective shots before she lured him back out farther. On the way back out I found a pair of Canada geese with five tiny goslings....and a pair of courting kingfishers. I headed out at 10:30am. 6:45 am a gorgeous but cold and windy morning...the sunshine is the most uplifting thing and motivator. Trumpeter swans landed on F Pool only to be quickly chased off by the terriotorial male whose mate is nesting across the pool. It was quiet in the woods...the little birds aren't too happy about the winds. E Pool is busy but everything is back farther out of the northwinds. I did find some green-winged teals and American wigeons along the F/E spillway....but they flew back further when they caught sight of me. Still lots of yellowlegs...but only a few Caspian terns...some Northern shovellers and northern pintails...trumpeter swans and Canada geese. I was blest to sit quietly for over two hours and witness a pair of Caspian terns courting. He brought her a fish...she nudged him lovingly. Then they copulated...with her reaching up and grabbing his beak in a loving kiss. I'm always amazed what I am privileged to witness if I am just patient and quiet...out with nature. I was so happy to find ABJ and his mate actually nesting. The merlins are definitely nesting on the back side of J Pool. I spooked two American bitterns out of the marsh on the back of F Pool/I Pool. I witenessed four Northern flickers courting and vieing for attention. And the ospreys were in their nest behind the Visitors Center. We went to the Toonerville Trolley to take down the old blind...and saw Junior. We then went to the rivermouth of the Tahquamenon to see if we could find the garganey teal or neotropic cormorant...to no avail. We went up to Whitefish Pt. and enjoyed lots of birds at the feeders and two snowshoe hares. I headed the Refuge around 10:00am with an east wind…partly cloudy and 48 degrees. The ring-necked ducks are in the Visitors show pool…and at the start of F Pool. I also found two male and one female hooded mergansers along the way. I was happy to see ABJ and his mate together…although that means they probably haven’t nested yet. They seemed to still be ‘looking’. I was finally able to get close enough to her later in the day to see her left leg band “V4” confirming that she is he mate. One of the F Pool territorial trumpeter swans was busy chasing interlopers out of his nesting area. As I was hiking along I heard the telltale scream of a merlin. I finally found her…and he was flying above her along F Pool. As I was heading back later in the day…I found their nest!! I’m not sure if they have ‘officially’ nested or if they are still in the construction stage. I am so excited. I love these little falcons. I heard more and more little songbirds along the way…but I’m not as knowledgeable about them as I am raptors and water birds. It was just a joy to sit and watch them flit around. Before I got to E Pool…I heard them…Caspian terns squawking and Greater yellowlegs peeping!! I spent over two hours sitting and watching all the activity on E Pool. Now that it is lower to allow for restoration along the Marshland drive…more water birds…dabblers and shorebirds are finding it a great place to stop and rest a spell. There were Northern shovelers…Northern pintails…green-winged teals…blue-winged teals…maybe an American wigeon or two…the Caspian terns…common mergansers…and tons of Greater yellowlegs. At times I didn’t know which way to look first. Then seven double crested cormorants landed on F Pool. I knew ABJ and his mate wouldn’t be happy about that. Luckily they just stayed a few minutes before heading north. It was a great three and a half hour time spent out with nature. Later in the evening I made the hike back to E Pool with my friend Jean Rautiola…still lots of action on E Pool and we got to see ABJ and his mate. I got to the Refuge around 11:30 after the weather cleared off a little. The temps were in the forties with a southeast wind. I meet my ruffed grouse puffed up and parading around again. A Northern male flicker seranaded me as I started my hike. Ring-necked ducks were in F Pool along with Canada geese and a few trumpeter swan pairs. A broad winged hawk flew over the marsh. I found one of the loons way out in the middle of F Pool. The little birds were really flitting about...ruby crowned kinglets...yellow rumped warblers...rose breasted nuthatches etc. I spent over an hour wathcing 24 Caspian terns fighting...flying and squawking on E Pool. The pool is really getting lower...which is going to make for some interesting dynamics this year on the Refuge. The Refuge has to do restroations to some of the banks along the Marshland Drive this summer...so they have to lower the water levels on E Pool. This will be a much needed benefit to keep the Drive open and safe for auto traffic. There were also several common mergnasers...fighting trumpeter swans and kingfishers on E Pool. The bald eagles both flew into the nest. I'm not so sure they have had any young. Hopefully they will re-clutch and be successful. It's sadly been a few years since they had a successful nest. As I headed back to the truck from E Pool I spent quite a bit of time enjoying the little songbirds that were migrating through. It was cold but at least not as windy and a little more activity...still just a joy to spend time with the wildlife at my Happy Place. A brisk 38 degrees with a north winds at 11:00 am...clouds then partly sunny. We found woood ducks in the channel along M77...and an osprey in the nest. Then back at 4:45pm to take a hike. A ruffed grouse was puffed up crossing the Entrance Rd. I heard a Wilson snipe flying as I started by hike around F Pool...and a male northern harrier was flying over the marsh. One loon on F Pool...does this mean they are already nesting?? Trumpeter swans are starting to nest already. I spooke a pair of hooded mergansers out of the little pool by the F/E spillway. About a dozen Caspian terns were enjoying themselves on the lowering E Pool...along with some common mergansers. I watched as an eagle nabbed a fish off of F Pool and a second eagle came in after it. They then headed back to the nest on E Pool. The ospreys were in their nest screaming at the time. I first thought an eagle was trying to get a fish from the osprey. A pair of sandhill cranes was wandering around E/H marsh...along with a dozen ring-necked ducks on H Pool that flew off as soon as the caught a glimpse of me. Some buffleheads were at the end of H Pool. A male kingfisher was chattering on J Pool...the female was further down chattering. I spotted the J Pool loon farther out. Another pair of sandhill cranes was cackling in F marsh. Merlins sounded like they were buildling a nest at the end of J Pool and then I heard more at the end of I Pool. I spooked a Wilson snipe out of the back side of F in the marshes. The Visitors Center osprey were in their nest along with ring-necked ducks and a pied billed grebe in the front pool. Sadly it was cloudy all day Sunday...so we headed southwest to find some sun and wildlife. By Monday it took all day for us to get to the Refuge. Finally after 2:00pm the sun starting arriving...but so did the north winds and 38 degree temperture. Still...any day we can spend time on the Refuge is a good day. The osperys have returned to their nest behind the Visitors Center. It is so good to hear them calling to each other. ABJ and his mate were out looking at nesting sites at the beginning of F Pool. It was great to see she has returned to celebrate her mate's 30th birthday. She is actually a year or two older than him...as estimated by Common Coast Research. They have been together more than 20 years...which is unusal for loons. They do not usually mate for life. Mrs. ABJ got bored with nest hunting and went off to preen....her usual MO...while he decided to do some fishing. The osprey pair was back at their nest on F Pool. E Pool is being lowered we found out...after a visit with Refuge manager Sara S. The banks need to have rocks added to shore up the drive along the Marshland drive. This will impact some of the wildlife but not as much as if they ignored the issue. So it will interesting to see how this will impact the other pools on Refuge...and the dynamics within. I did find some blue-winged teals in the channel between E and H Pools. A pair of sandhills flew over H to E. A pair of trumpeter swans was working on a nest on one of the islands in J Pool while a pair of kingfishers chased each other around. As I circled around I Pool I spooked up some ring-necked ducks and a femal sharp-tailed grouse. It was a nice hike despite the cold and wind. It was just great to have ABJ and his mate back together...making it worth all worthwhile. Finally the clouds moved out around 9:30am as I made way to the Refuge. The day started with a slight breeze and forty degree temps...but quickly warmed up as the sun broke through the clouds. I hiked around F Pool to find ABJ who had just been confirmed returned on Tuesday. I found him near the spillway area. I was able to spend some time with him as he fished his way around the channel. He was intently looking in the sky for the return of his mate....hopefully soon. He will be 30 years old this year...the first known banded loon in 1987. Adult banded juvenile...which all of the loons are called when first banded...but he is the first and so he is capitalized...ABJ. Kingfishers are courting...chasing each other around E and F Pools. There are lots of trumpeters swans on E Pool with several pair having already staked out nesting sites. I found a pair of green-winged teals on E Pool but they quickly flew. I have yet to get very close to these skittish birds. A male song sparrow seranaded me...along with red-winged blackbirds...grackles...yellow rumped warblers etc. I hears snadhill cranes cackling all around the Refuge...the sounds of Spring were everywhere. A male common merganser flew from F over to H Pool. Yeah...our J Pool male...AT...is back. He spent time along the channel where I got a chance to see his band. I sat and ate my lunch with him....perfect setting. Then wave after wave of sandhill cranes started flying over me!!! They were flying from the southwest heading northeast. Talk about perfect....what a better way to spend time out with nature!!! There had to have been well over two hundred sandhills flying!!! I circled back by I Pool where a few trumpeter swans were staking claims...I spooked a few ring-necked ducks, too. There were a few hooded mergansers on the pool in front of the Visitors Center. Then I headed over to the Wigwams were I enjoyed a little activity on the North Show Pool. The male trumpeter swan came up to where I was sitting on a stump. Sadly you can tell that people are feeding them. It's illegal to feed wildlife on the Refuge...and deadly to them if you feed them bread. Anyways I told him not to beg...so he preened a little for me. As I was shooting him...his mate decided to get in on the action. Then a litte snowy bunting buzzed by my head...landing on a log in the water near me. How sweet to get that close to one of these hyper little birds. Then the Canada goose pair came over to pose for me. Amazing what gifts you are given if you just sit still and be quiet. Well, the male trumpeter swan went up on land further back on the pool to really preen and clean. So I decided to walk back that way. On my way I found the snow bunting feeding in the tall grasses at the edge of the pool.